The strengthening phase is about to begin. 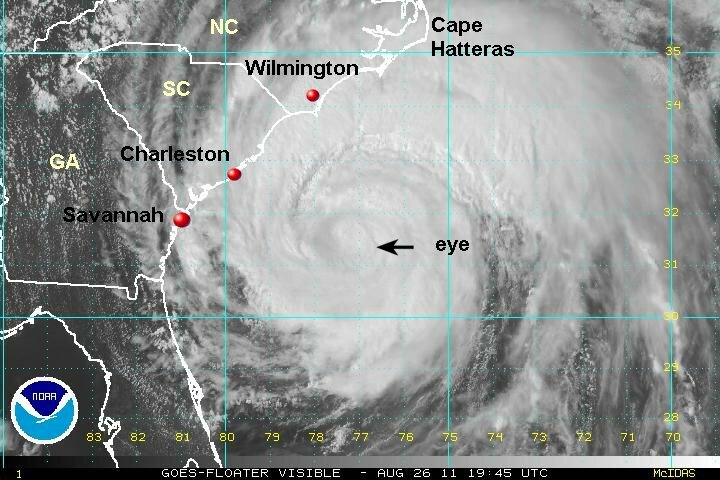 Visible satellite imagery shows an eye now forming. It is also pulling away from Hispaniola so that the low level inflow will no longer be blocked. Irene continues to the wnw and and will be passing just south of Grand Turk and just north of Great Inagua in the southern Bahamas. The forecast track has shifted slightly east which could have major implications to the Northeast U.S. The forecast is detailed below. 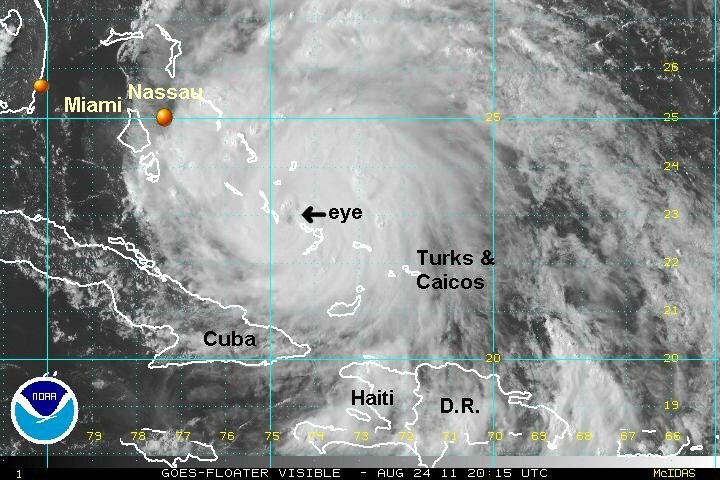 As of 11 am edt / ast Irene was centered near 20.5 N / 71.0 W or about 70 miles south of Grand Turk. It is moving wnw at 12 mph. Top sustained winds are estimated at 95 mph (NHC 100 mph last advisory). Pressure is estimated at 980 mb. Irene is headed generally west northwest into the southern Bahamas and Turks and Caicos. It is projected into the central Bahamas tomorrow where it is expected to make an abrupt north turn late in the day. Thursday the forecasts take it into the northern Bahamas. Friday it is projected north of the Bahamas heading toward the North Carolina coast. Irene is forecast near the eastern coast of North Carolina Saturday and will either move inland at this location or hug the coast northward. Models recently have shifted east by about 50 miles. This would allow Irene to retain strength as it moves along the coast. Irene is forecast off of the New Jersey coast then inland in southern New England Sunday. Remember, long range forecasts can have large errors in time and location. Puerto Rico radar has estimated at least 8" of rainfall with a nearly stationary rainband over the central part of the country. Rainfall totals of more than 12" are possible before Irene moves away. Parts of Hispaniola have also seen heavy rainfall with about 7 1/2" being reported near Sanchez in the northeastern part of the country. Amounts were uncertain over the mountainous terrain. NHC dropped their top sustained winds to match my earlier estimate. They had mentioned that they thought that the earlier estimate was generous. It's possible that we're both still a little high with the pressure of 976 mb. Strengthening is still forecast as Irene pulls away from Hispaniola. As of 5 pm edt / ast Irene was centered near 20.9 N / 71.5 W or about 50 miles ssw of Grand Turk / 110 miles east of Great Inagua, Bahamas. It is moving wnw at 9 mph. Top sustained winds are estimated at 90 mph (NHC 90 mph last advisory). Pressure is estimated at 976 mb. 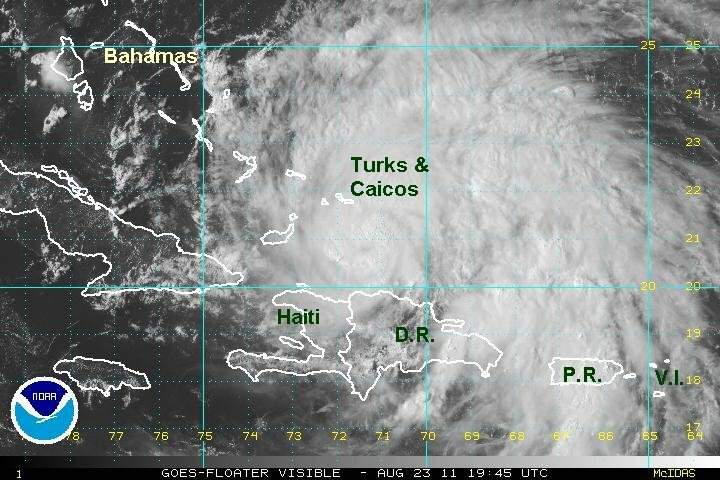 Irene is headed west northwest into the southern Bahamas and Turks and Caicos. It is projected into the central Bahamas tomorrow where it is expected to make an abrupt north turn late in the day. Thursday the forecasts take it into the northern Bahamas. Friday it is projected north of the Bahamas heading toward the North Carolina coast. Irene is forecast near the eastern coast of North Carolina Saturday and will either move slightly inland at this location or hug the coast northward. Models recently have shifted east by about 50 miles. This would allow Irene to retain strength as it moves along the coast. Irene is forecast off of the New Jersey coast then inland near Long Island Sunday. Interests in se Cuba, Hispaniola, Bahamas, Turks and Caicos, and U.S. coast Florida to New England should follow this tropical cyclone closely. Irene's low level inflow is no longer being blocked by Hispaniola. As expected, strengthening has begun. Pressure is dropping and a well defined eye is now visible. 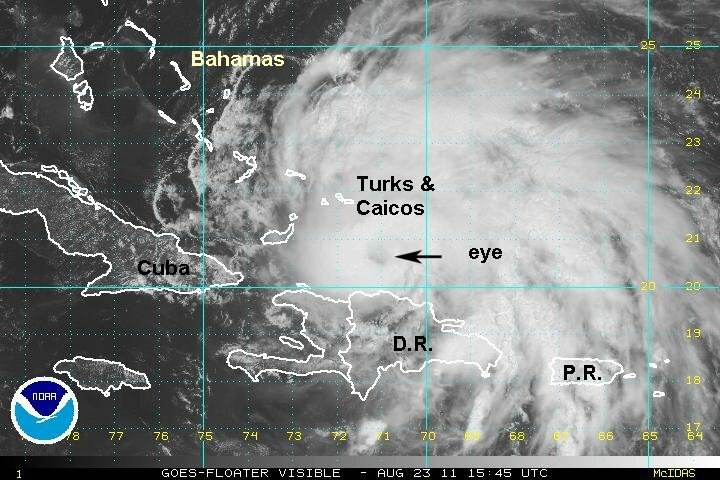 The eye will pass over Providenciales west of the Caicos. 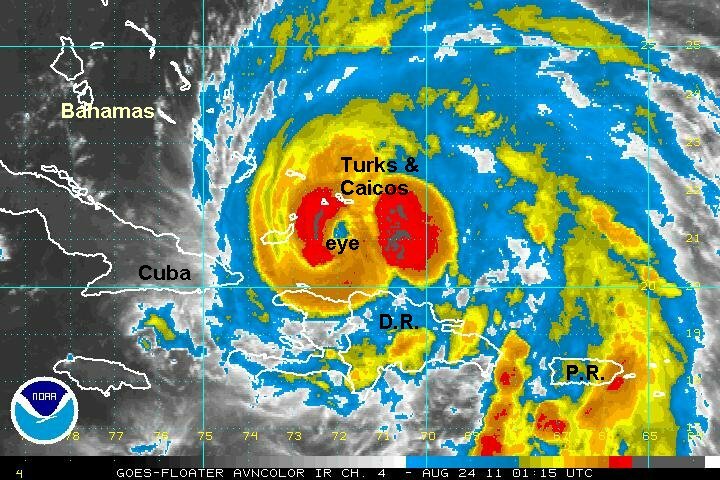 The eye wall is affecting Great Inagua, Grand Turk, and the Caicos. Acklins and Crooked Island will be next in the path of Irene. Several rainbands still extend into the Virgin Islands and Puerto Rico. A large area of rainfall in excess of 8" has fallen over central and eastern Puerto Rico as determined by doppler radar. Also NOAA sea height analysis estimates seas at 25 feet near the eyewall. Seas will get much higher as Irene strengthens. As of 11 pm edt / ast Irene was centered near 21.3 N / 72.4 W or about 410 miles se of Nassau, Bahamas / 980 sse of Cape Hatteras, North Carolina. It is moving wnw at 9 mph. Top sustained winds are estimated at 90 mph (NHC 90 mph last advisory). Pressure is estimated at 969 mb. 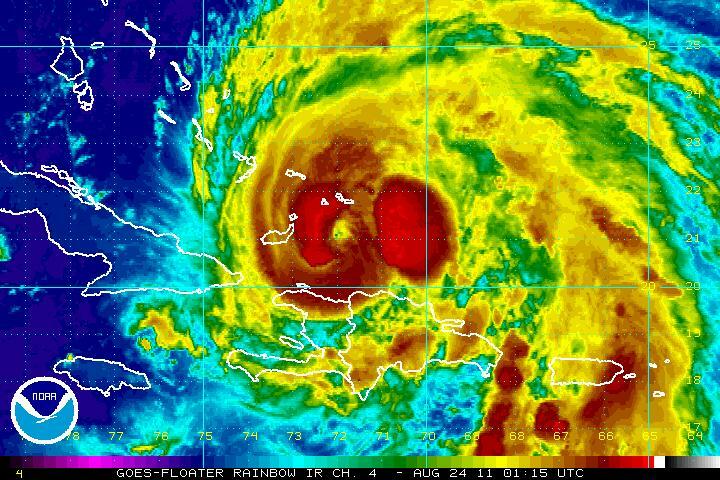 Irene is between the Caicos and Great Inagua in the southern Bahamas. It is projected into the central Bahamas tomorrow where it is expected to make an abrupt north turn late in the day. Thursday the forecasts take it into the northern Bahamas. Friday it is projected north of the Bahamas heading toward the North Carolina coast. Irene is forecast near the eastern coast of North Carolina Saturday and will either move slightly inland at this location or hug the coast northward. Models recently have shifted east by about 50 miles. This would allow Irene to retain strength as it moves along the coast. Irene is forecast off of the New Jersey coast then inland near Long Island Sunday. Interests in ne Cuba, northern Haiti, Bahamas, Turks and Caicos, and U.S. coast Florida to New England should follow this tropical cyclone closely. 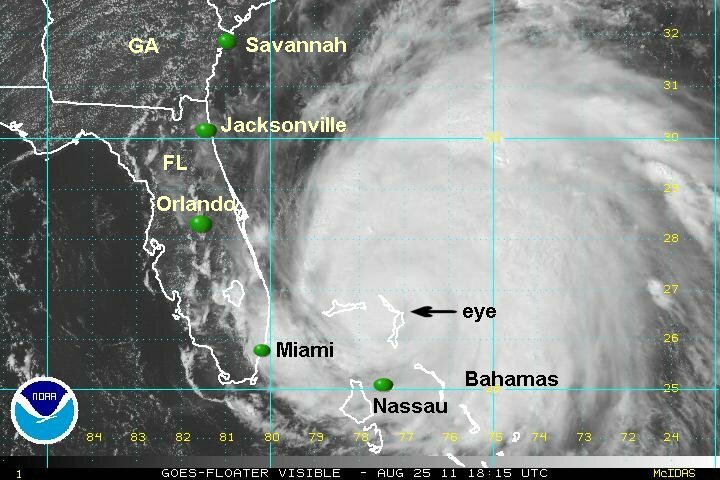 Irene's eyewall is expanding as the hurricane is moving from the southern to the central Bahamas today. It will be approaching the eastern side of Crooked Island by this afternoon. Rainbands still extend far to the east and will continue to affect Hispaniola, Puerto Rico and the Virgin Islands today. Our wind estimate is a little lower than the hurricane's center's estimate. For the given pressure, I don't believe that there are sustained surface winds of 115 mph yet. With a wind of 115 mph, one should see gusts to about 130 mph and I don't believe that is the case yet. The pressure is steadily dropping which indicates strengthening, but usually it takes a few hours for the pressure drop to be translated into stronger winds. As of 8 am edt / ast Irene was centered near 21.9 N / 73.3 W or about 335 miles se of Nassau, Bahamas / 920 miles south of Cape Hatteras, North Carolina. It is moving wnw at 9 mph. Top sustained winds are estimated at 105 mph (NHC 115 mph last advisory). Pressure is estimated at 957 mb. Irene is in the southern Bahamas. It is projected into the central Bahamas today where it is starting to turn more northwest. Tomorrow the forecast takes it into the northeastern Bahamas. Friday it is projected north off of the Southeast coast. Saturday Irene should approach the coast of North Carolina near Cape Hatteras and off of Virginia Beach later in the day. Sunday Irene is forecast off of the New Jersey coast then near eastern Long Island before moving into southern New England later in the day. This forecast is slightly faster than the previous models by roughly 6 hours. Interests in the Bahamas, Turks and Caicos, and U.S. coast Florida to New England should follow this tropical cyclone closely. 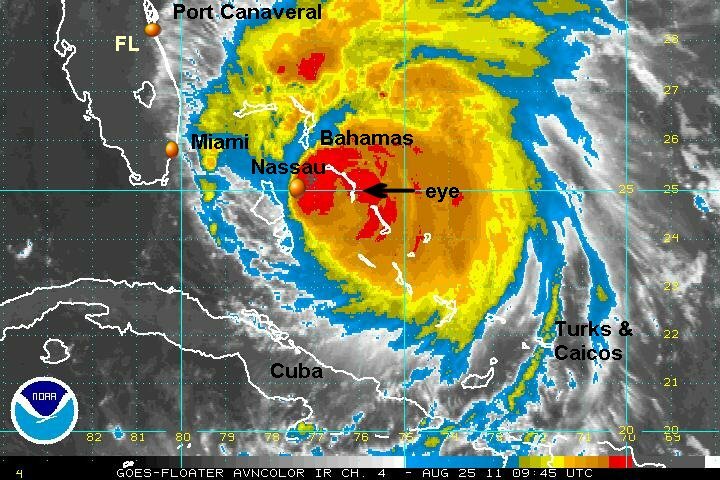 Irene is on its expected strengthening phase as the eye is now over Acklins and Crooked Islands in the southeastern Bahamas. It will pass just east of Long Island in the east central Bahamas later today. Forecast models have inched a little farther east of Cape Hatteras on the last run. This is significant since every few miles farther east could mean the difference between the eyewall being over land or offshore. As of 12 pm edt / ast Irene was centered near 22.5 N / 74.0 W or about 275 miles se of Nassau, Bahamas / 910 miles south of Cape Hatteras, North Carolina. It is moving nw at 12 mph. Top sustained winds are estimated at 115 mph (NHC 115 mph last advisory). Pressure is estimated at 956 mb. 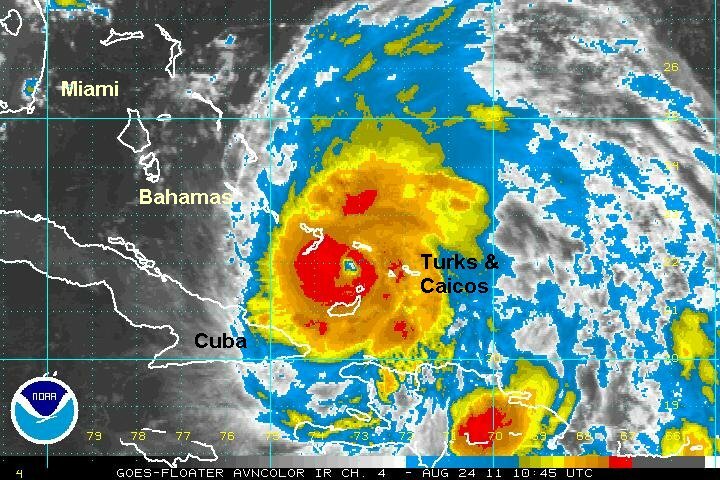 Irene is in the southern Bahamas. It is projected into the central Bahamas today where it is starting to turn more northwest. Tomorrow the forecast takes it into the northeastern Bahamas. Friday it is projected north, off of the Southeast coast. Saturday Irene should approach the coast of North Carolina near to about 50 miles east of Cape Hatteras and east off of Virginia Beach late in the day. Sunday Irene is forecast off of the New Jersey coast then near eastern Long Island before moving into southern New England later in the day. This forecast is slightly farther east near the North Carolina coast. Interests in the Bahamas, Turks and Caicos, and U.S. coast Florida to New England should follow this tropical cyclone closely - especially North Carolina northward. My strength estimate now matches the hurricane center's as the eye is getting smaller and supports the current strength. Irene is just east of the southern end of Long Island, Bahamas. The most reliable forecasts diverge a little once Irene is near New Jersey. The range is from near the New Jersey shore to about 50 miles east. The forecast details are outlined below. As of 5 pm edt / ast Irene was centered near 23.1 N / 74.7 W or about 215 miles se of Nassau, Bahamas / 845 miles south of Cape Hatteras, North Carolina. It is moving nw at 12 mph. Top sustained winds are estimated at 120 mph (NHC 120 mph last advisory). Pressure is estimated at 954 mb. 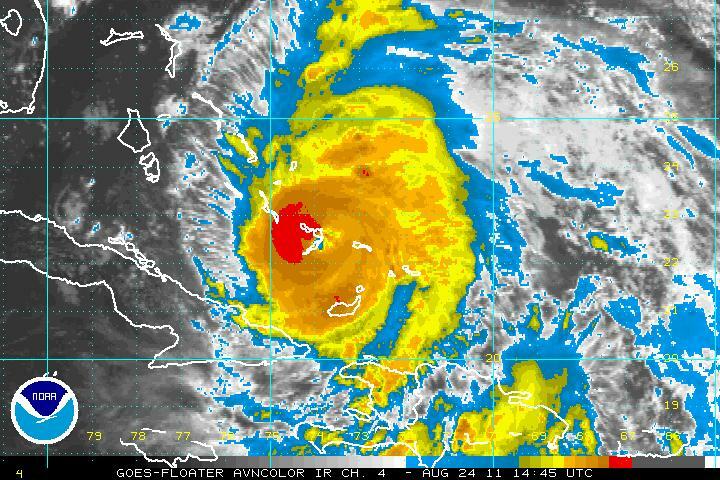 Irene is moving into the central Bahamas where it is turning northwest. Tomorrow the forecast takes it into the northeastern Bahamas. Friday it is projected north, off of the Southeast coast. Saturday Irene should approach the coast of North Carolina near to about 50 miles east of Cape Hatteras and east off of Virginia Beach late in the day. Sunday Irene is forecast near to 50 miles off of the New Jersey coast then near eastern Long Island before moving into southern New England later in the day. Interests in the Bahamas, Nova Scotia, Canada, and U.S. coast Florida to New England should follow this tropical cyclone closely - especially North Carolina northward. No major changes in the forecast track or intensity this evening. next complete update will be Thursday early am. Irene is currently over the southern end of Eleuthera, Bahamas. Information from the latest hurricane hunter has some curious results. Pressue has dropped a touch. This would usually be associated with slight strengthening or retaining strength. The winds found were much lower than previously found... a roughly 85 mph surface wind and flight level of near 115 mph. This means that Irene in actuality is not a major hurricane at this time. The hurricane center kept the winds up IMO for continuity sake and believeing that the strengthening would resume (as I do). They also mentioned that they thought their estimate was generous. IR satellite on the other hand shows considerable warmer cloud tops which would support the recent weakening. It appears that Irene is turning a little more and I have estimated current direction of motion as nnw as opposed to NHC's retaining the nw motion. There also has been a westward trend in the recent models outlined below. As of 5 am edt / ast Irene was centered near 24.6 N / 76.2 W or about 80 miles ese of Nassau, Bahamas / 735 miles south of Cape Hatteras, North Carolina. It is moving nnw at 12 mph. Top sustained winds are estimated at 105 mph (NHC 115 mph last advisory). Pressure is estimated at 950 mb. 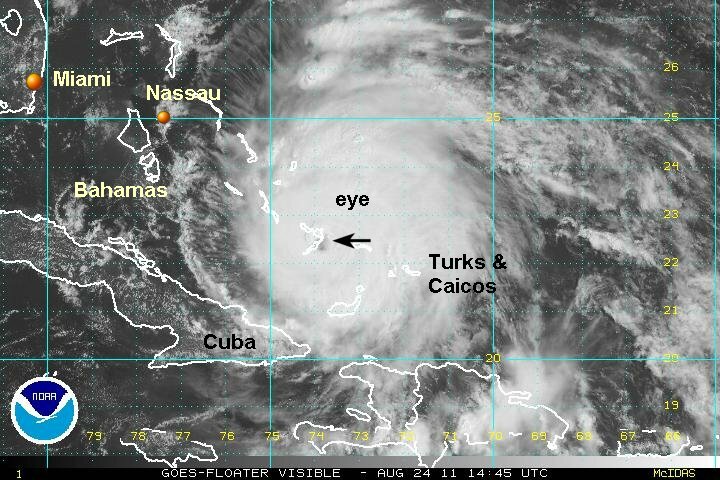 At noon edt Irene was centered just east of the Abacos, Bahamas. 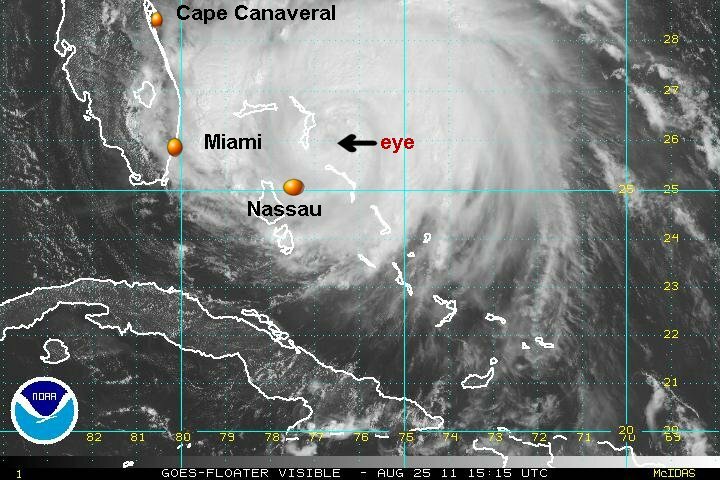 The temporary weakening this morning is likely over as the eye is becoming better defined again. I still believe that Irene is not a major hurricane as maximum sustained winds at the surface were estimated at about 85 mph from the recon. The hurricane center again mentioned earlier that they believe that their estimate is generous. With winds of 115 mph gusts should be near 130 mph. These wind values have not been seen. It's very possible that if the eye reforms today those wind speeds can be achieved again. As of 12 pm edt / ast Irene was centered near 26.0 N / 76.8 W or just east of southern Abaco Island, Bahamas / 635 miles south of Cape Hatteras, North Carolina. It is moving north at 13 mph. Top sustained winds are estimated at 100 mph (NHC 115 mph last advisory). Pressure is estimated at 952 mb. Forecasts take Irene off of the Southeast coast tomorrow and between Beaufort and Cape Hatteras North Carolina around midday Saturday and near Virginia Beach Saturday Evening. Sunday morning Irene will be near the Maryland / Deleware coast. It will move up the New Jersey coast during the day into Long Island east of New York City Sunday afternoon.....continuing inland into New England Sunday night. Interests in Nova Scotia, Canada, and U.S. coast Florida to New England should follow this tropical cyclone closely - especially North Carolina northward. This will not only be a coastal event! The big cities of the Northeast, Washington, D.C., Baltimore, Philadelphia, New York city, and Boston will likely see very heavy rainfall and strong winds. Serious flooding is also likely. This is an unusual event, so don't take this situation lightly! Little change has occured today. I still believe that the winds are overestimated. The last recon still only estimated the surface wind of 80-85 mph. My estimate of 100 mph and NHC's estimate of 115 could be considerably over the actual winds. 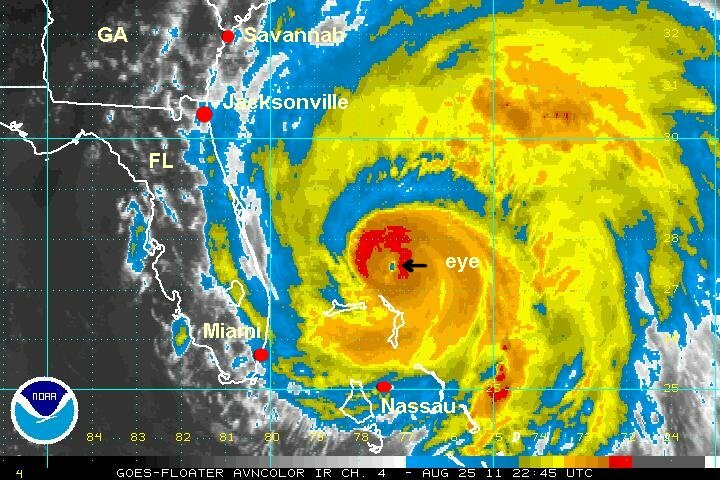 Irene is still expected to strengthen when the eyewall structure reforms. 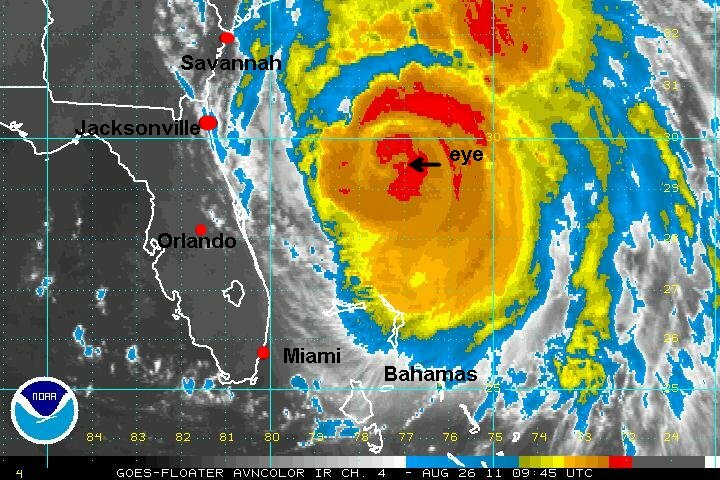 As of 4 pm edt / ast Irene was centered near 26.8 N / 77.3 W or just north of Abaco Island, Bahamas / 595 miles south of Cape Hatteras, North Carolina. It is moving nnw at 13 mph. Top sustained winds are estimated at 100 mph (NHC 115 mph last advisory). Pressure is estimated at 950 mb. The last report from the recon reported that the pressure has started to fall again. IR satellite imagery also show that the eyewall is redeveloping which will allow for further strengthening. It's possible that a rapid deepening is still possible. If it were to happen, it would likely be during later tonight and tomorrow. So far, a methodical strengthing occured yesterday. Our strength estimate once again matches the hurricane center's now that the eyewall has restrengthened. Unfortunately reports from the Bahamas are always very sparse. Radar from Miami and Melbourne, Florida show the eye on long range. A strong rainband is about 50 miles east of the Florida coast. As of 8 pm edt / ast Irene was centered near 27.7 N / 77.4 W or north of Abaco Island, Bahamas / 530 miles ssw of Cape Hatteras, North Carolina. It is moving nnw at 14 mph. Top sustained winds are estimated at 115 mph (NHC 115 mph last advisory). Pressure is estimated at 946 mb. Irene thankfully, never did strengthen last night as models were hinting at. The pressure is fairly low at 942 mb, but the hurricane hunter aircraft only found estimated winds at the surface of 75 mph. This is very curious since a pressure of 942 mb usually is associated with a cat 3 hurricane. It's possible that the strongest winds weren't sampled. I suspect though that Irene is weaker than advertised. 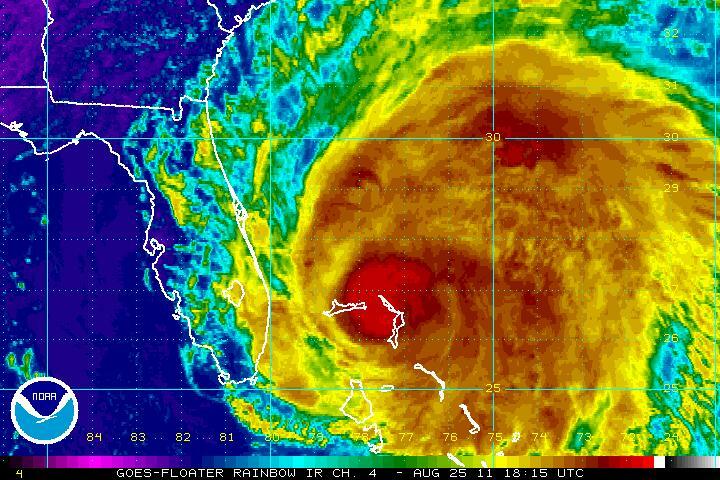 Yesterdday I mentioned that Irene was not a category 3 three hurricane (and may never have been at all). IR satellite imagery shows that the eyewall never built strongly last night and that cloud tops are warm - indicating a weaker hurricane than the pressure would show. My wind estimate will be lower than NHC's until the recon or satellite can actually find data to support stronger winds. Remember the winds reported are surface sustained winds - the gusts should be 15% higher. A buoy east of Florida and north of the Bahamas had reported seas up to 32 feet last night and a wind gust to 74 mph. NOAA sea analysis show highest seas around 43 feet. As of 6 am edt / ast Irene was centered near 29.4 N / 77.2 W or 405 miles ssw of Cape Hatteras, North Carolina. It is moving north at 14 mph. Top sustained winds are estimated at 105 mph (NHC 110 mph last advisory). Pressure is estimated at 942 mb. Forecasts take Irene off of the Southeast coast today and between Beaufort and Cape Hatteras North Carolina around midday to later afternoon Saturday and near Virginia Beach late Saturday afternoon to early Evening. Sunday morning Irene will be near the Maryland / Deleware coast. It will move up the New Jersey coast during the day into Long Island / southern New England Sunday afternoon.....continuing inland into New England Sunday night. Two of the three forecast models that I looked at were a little slower and takes Irene over Cape Hatteras into southern New England. Another one is a little faster and farther west into Beaufort, NC and closer to the coast into central Long Island. The difference is only about 50 miles farther east but this will make huge differences in the weather seen on the coast if the track ends up farther east. Interests in Nova Scotia, Canada, and U.S. coastal states, South Carolina to New England should follow this tropical cyclone closely. Irene is still not changing in intensity much. If anything it is weakening a touch. A new recon hurricane hunter report indicated surface winds of 84 mph and a flight level wind of about 115 mph. There is a way to estimate surface winds from the flight level winds. The calculation in this case would be from 10 K feet which should lead to a significantly lower wind than 115 mph. For some reason Irene's surface winds during the past 2-3 days have not been representative of a low pressure in the 940-950 mb range. In any case my wind estimate is a little lower again since the hurricane hunter didn't find strong winds. Keep in mind wind gusts cas be at least 15% above the sustained wind. Expect heavy rain to pick up later today on the North Carolina coast as he first raindband approaches. Buoys should seas 10-12 feet east of the NC and SC coast. They will be getting larger shortly. NOAA sea analysis show highest seas around 43 feet. 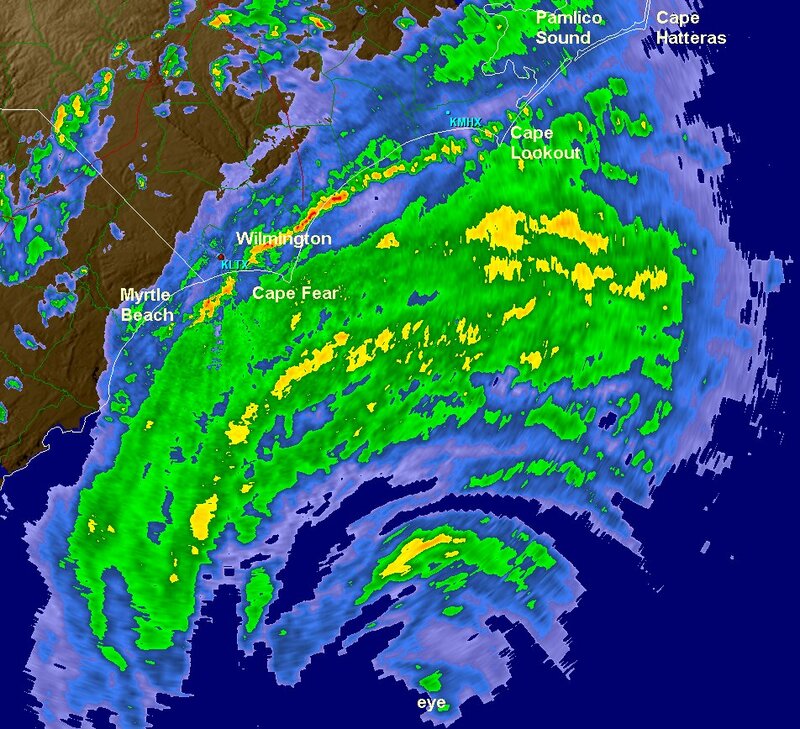 As of 10 am edt / ast Irene was centered near 30.4 N / 77.4 W or 310 miles ssw of Cape Hatteras, North Carolina. It is moving north at 14 mph. Top sustained winds are estimated at 100 mph (NHC 110 mph last advisory). Pressure is estimated at 947 mb. NHC dropped winds to 105 to more closely match my 100 mph estimate. We both still could be high. The recon is still not finding surface winds greater than cat 1 strength. Little change has occured in strength today except for some slight weakening. It is still my opinion that my estimate and the hurricane center's estimate are both a little high. The recon has still been finding surface winds of aboiut 80 mph today. 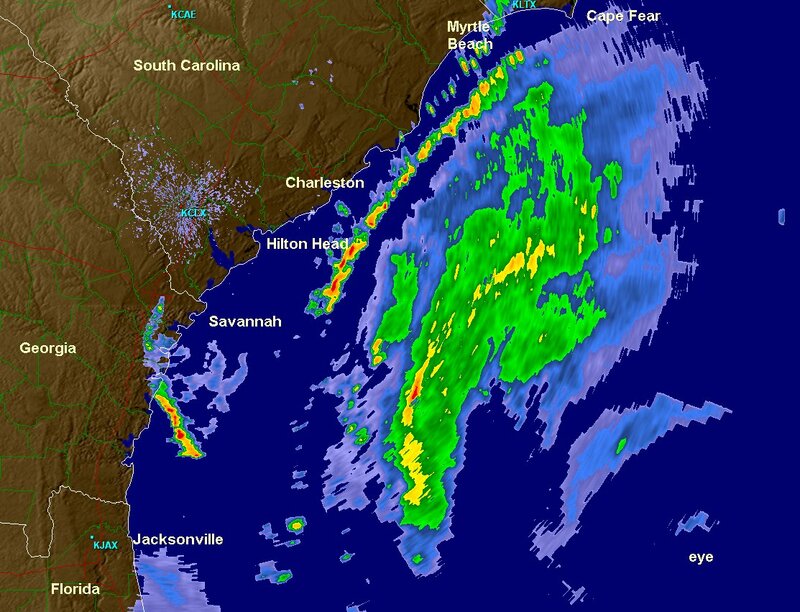 A large rainband of Irene is now inland from south of Myrtle Beach to north of Cape Hatteras. Small bands of scattered heavy storms are preceeding this one farther inland. Doppler radar has estimated local rainfall amounts of 1- 2.5" in isolated spots. The latest buoy's are as follows: 41 miles se of Charleston, SC - winds gusting to 60 mph, seas 25 feet. Frying Pan shoals southeast of Wilmington, Winds gusting over 50 mph, seas 20 feet. NOAA sea analysis show highest seas around 43 feet near the low center well offshore.. The hurricane center is estimating a storm surge of 4-8 feet on the coast of NC. Keep in mind that this surge will also be up the rivers and sounds of eastern North Carolina. 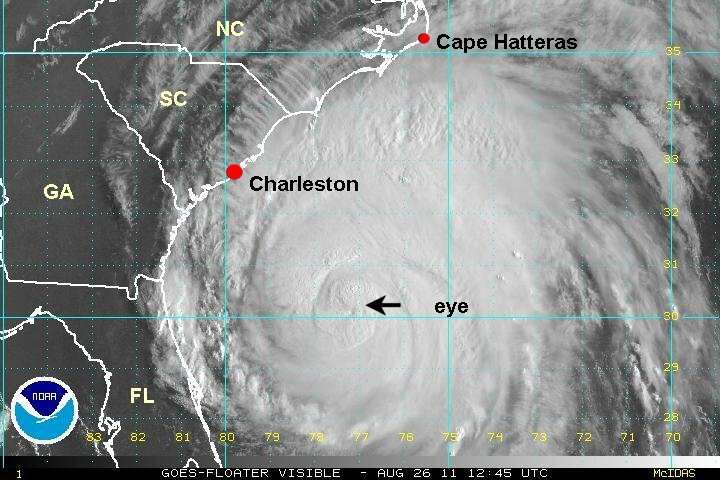 As of 5 pm edt / ast Irene was centered near 31.7 N / 77.4 W or 265 miles ssw of Cape Hatteras, North Carolina. It is moving north at 14 mph. Top sustained winds are estimated at 95 mph (NHC 100 mph last advisory). Pressure is estimated at 951 mb. Forecasts take Irene between Beaufort and Cape Hatteras North Carolina around tomorrow morning to midday and near Virginia Beach late Saturday afternoon to early evening. Sunday morning Irene will be near the Maryland / Deleware coast. It will move up the New Jersey coast during the day into Long Island / southern New England Sunday afternoon.....continuing inland into New England Sunday night.